When it comes to setting your watch, many people dial “popcorn” from a landline phone, use www.time.gov on the web, or pull time from their mobile phone. Mobilephones sync with the local tower and provide fairly accurate time will little drift. For iOS iPhones and iPads, there is one application that any watch aficionado should have. Gorgy Timing Atomic Clock, available in the Apple app store at $1.99 as well as available for Android, is a great app to set your watch. The Atomic Clock app opens and syncs to the atomic timing server that you choose. The Atomic Clock app face is easily readable showing analog time, and a visual indicator for seconds. This is a small app, uses little bandwidth and storage space, and has plenty of preference options. The app allows for syncing to an atomic timing server at startup, or manually (I have mine set to sync at startup). There are alarm options such that the app can double as an alarm clock complete with its own alarm sounds. There are plenty of display options, colors, and visual style, as well as a choice of it reading in 12-hour or 24-hour format. There are options for showing 1/60th of a second for you 5mhz chronographs, night mode that allows dimming when used as a nighttime alarm clock. One of the neat features is enabling a tick sound for every second. The tick sound allows you to hear when to depress the time setting crown of your watch so that the watch second hand and the Atomic Clock are synchronized. When run on an iPhone, the app does not allow for the phone to dim or sleep, making it a good desk clock when plugged into a dock or desk stand. The Atomic Clock face is high contrast, and the digital numbers are easy to read from across the room. Atomic Clock is designed for both the iPhone and iPad in one download with no need for purchasing another app for your iPad. The iPad face fills the screen without pixilation; it does not look like an iPhone app stretched across an iPad screen. 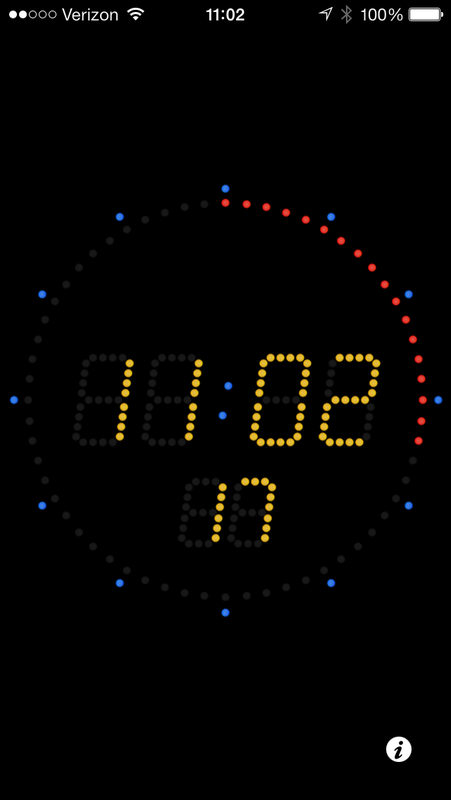 Atomic Clock is a great little app for watch lovers –it’s inexpensive, easy to use, fun to watch, and is a go-to app for when it time to synchronize your wrist watch to an atomic time server.